From being our friends to rescuing trapped people, dogs can do it all. 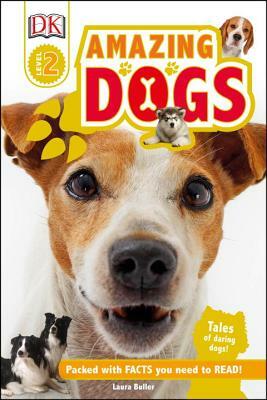 Discover all the incredible things dogs can do in Amazing Dogs. Dogs help people every day with their powerful senses and friendly personalities. Find out what else they can do in Amazing Dogs. Perfect for 5–7 year olds beginning to read fluently with support, Level 2 titles contain carefully selected photographic images to complement the text, providing strong visual clues to build vocabulary and confidence. Additional information spreads are full of extra fun facts, developing the topics through a range of nonfiction presentation styles such as diagrams, and activities. Trusted by parents, teachers, and librarians, and loved by kids, DK's leveled reading series is now revised and updated. With shiny new jackets and brand new nonfiction narrative content on the topics kids love, each book is written and reviewed by literacy experts, and contains a glossary and index making them the perfect choice for helping develop strong reading habits for kids ages 3–11. Laura Buller is an author of books for young readers. Her titles include Star Wars: Star Pilot (DK Readers), The Great Panda Tale, and Myths and Monsters: From Dragons to Werewolves.